Hi, we are team 11442N from Hewitt Robotics. We are an all girl team. We hope this entry inspires you. WOULD LIKE TO REGISTER 47M FOR GIRL POWERED COMPETITION SINCE THIS TEAM HAS 3 GIRLS OUT OF A TEAM OF 4. 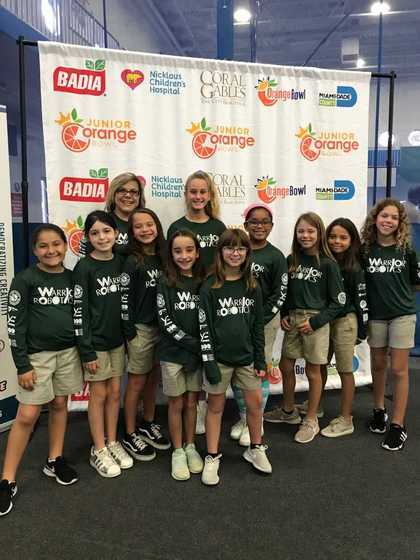 Citi Gals: All girl robotics team in Jacksonville Florida sponsored by Citi. 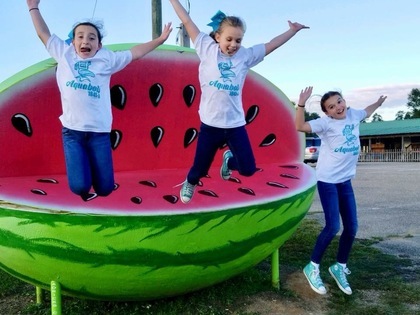 "Optimism is the faith, that leads to achievement" - Adya and Sonya's journey to show the world that girls can do anything when they come together!! We Have Girl Power! What's Your Superpower? MEANWHILE.. IN MISSISSIPPI THERE WERE THREE DIVERSE SUPERHEROES. THEY USED THEIR DIVERSITY TO WORK TOGETHER TO OVERCOME CHALLENGES. THEY WERE DIVERSE BECAUSE OF THE DIFFERENT ABILITIES (SUPERPOWERS) THEY EACH HAD. THEY JOINED TOGETHER TO BECOME THE AQUABOTS, AN ALL-GIRLS ROBOTICS TEAM, TO SAVE THE WORLD, ONE DAY AT A TIME…..
‘Jobs for girls and jobs for boys’. This has been taught to us since childhood. It’s not a problem of our school, but a cultural, patriarchal and sexist one. 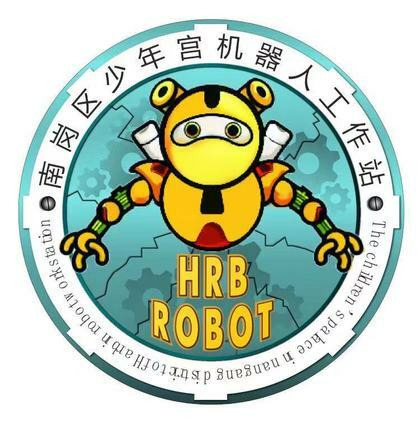 We realized that a girl can and should break the barriers, and represent the movement of participation of the students in the field of robotics. Therefore, the Girl Powered appeared. It is not just the name of a movement that is popular nowadays, but the need to include and match the boys' knowledge and skills with the girls’ as well. Girl Powered! to the MAX! Girl Powered! to the Max! was written by 10 fifth grade girls from Westminster Christian School in Miami, Florida. 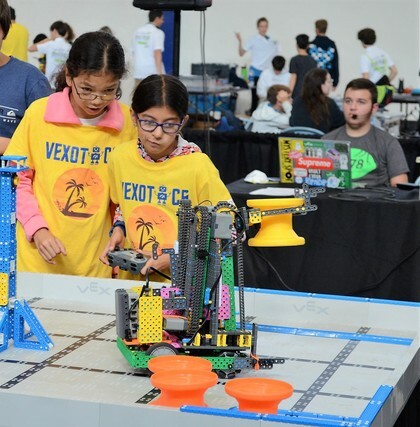 (Team 6855B) Come on a journey through this year's season with a group of 10 diverse girls and their female coach as they entice your desire to learn more about VEX IQ. Find out how they prepare for the season, what makes them inspire others, and who is the STEM mentor that inspired them. We are Team GMR, 10700B, and equal opportunity has served as a major basis for our team. Diversity has been an vital asset to us, helping overcome obstacles on our Journey to Excellence, where we faced many challenges. Though we have many differences as individuals, together we strive for success. Girls! The strength is in our hearts! When you hear the word “power” most of us imagine brave, fighters, warriors, knights. No one thinks about girls, their abilities. Female’s destiny is the weakness, patience and eager expectation of help. In short, girls, strength is not about us. Wait, stop. Stop-stop-stop! Why most people believe that girls are not able to do what boys are to? We can also fight hardships, create something new, be experts in various fields too. Technologies and robotics are very important in modern life. We are the Girl-Powered Robogators from Ware County, Georgia. 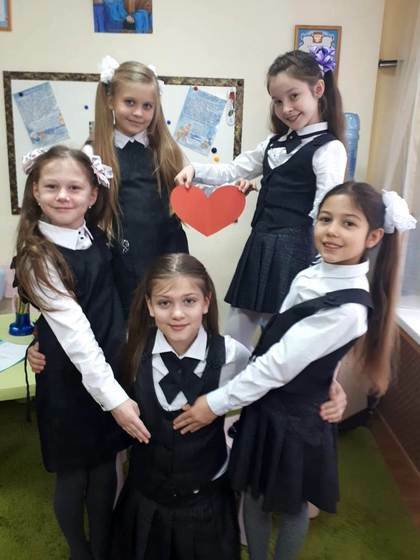 Our team consists of three girls and two boys. We believe that both boys and girls have great ideas and that having diversity on the team helps us to be more creative and successful. We invite you to read our essay and learn about how our team is creating a positive experience for students of all genders and backgrounds. This is the story of our team and what being Girl Powered means to us. We are the CIRCUIT GIRLS! We are "Girl Powered " from China . 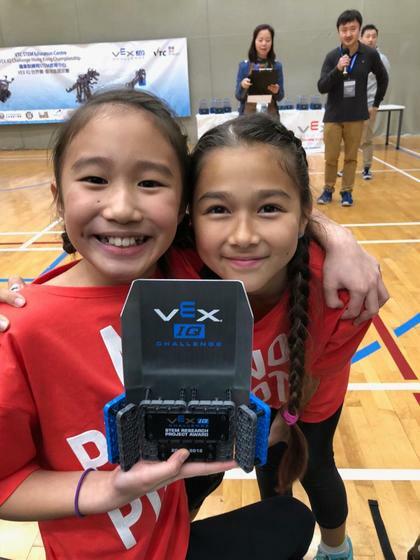 VEX China 2018 /9162C . Xiaolou ,the girl and her teammates Tiancheng and Qijun , two boys . We call ourselves " salted fish" as it forecasts "a turn-point " in chinese saying , We would love to create the "turn-point " by being more close to the diversed world . PLEASE SEE ATTACHED PDF FOR THE FULL PRESENTATION WITH PHOTOS. I’m an American who was born in Austria, currently living in Hong Kong. 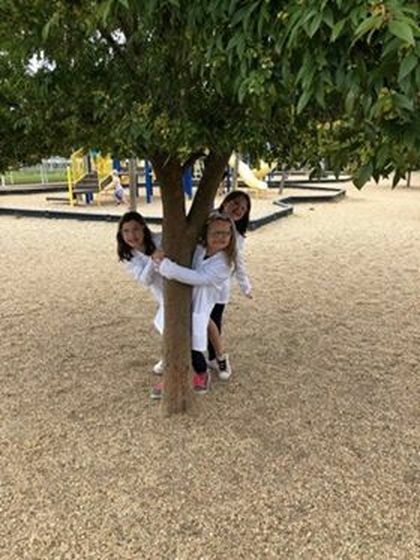 I’m a Grade 6 student at Hong Kong International School, and a member of Girl Scout Cadette Troop 20. I enjoy Kung Fu, playing video games and helping others. I also have 3 lazy cats who like to destroy our robot at times. We are 952G, a Girl Powered team! As a Girl Powered team, we work together, we win together, and we lose together. We are a team of strong and powerful girls supporting eachother. Our gender will never define us. Read our project to learn more! 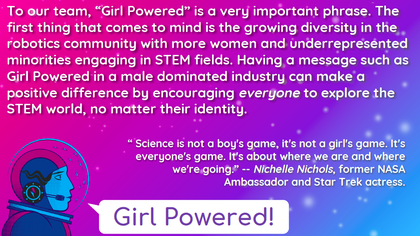 To our team, “Girl Powered” is a very important phrase. 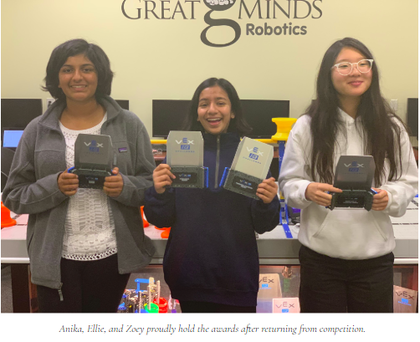 The first thing that comes to mind is the growing diversity in the robotics community with more women and underrepresented minorities engaging in STEM fields. Having a message such as Girl Powered in a male dominated industry can make a positive difference by encouraging everyone to explore the STEM world, no matter their identity. We are 952G, a Girl Powered team! As a Girl Powered team, we work together, we win together, and we lose together. We are a team of strong and powerful girls supporting each other. Our gender will never define us. Read our project to learn more! We are Team 117A, Mad Scientists, and we ARE the meaning of GIRL POWERED!! !